Welcome to a dragon-filled, sci-fi/fantasy reviewing, list-filled blog! Fireborn by Toby Foward is a juvenile companion novel to Forward’s Dragonborn, set in a different time but the same fantastical world. I haven’t read Dragonborn and was under the impression by “companion novel” that that wouldn’t impede my reading of Fireborn. I’m not sure if that is the case, but if you think it would have made a difference, let me know! As it was, let me just say that there are no dragons…. Disappointment :(. While Fireborn has an interesting world and adventure to it, it is not appropriate for the full range of middle-grade readers and it just didn’t really draw me in. Note: I received Fireborn through Netgalley for an honest review. If magic sets the world on fire, something new is born from the flames. When an old, dying wizard steals magic from his young apprentice, Bee, he changes his own life and nearly destroys hers. But he also releases something new into the world - a wild magic that turns fields to flames and upsets the order of the world. It will take another apprentice, Cabbage, to find Bee and try to set the world right again. There are pieces of Fireborn such as the magic and the different creatures that was fascinating. In hindsight, I actually did enjoy the overall story too, but those pieces didn’t fit together all that great. The world that we are given glimpses of in Fireborn looks awesome. 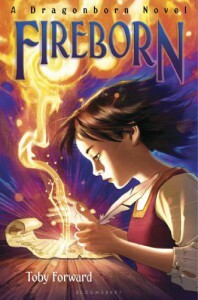 Fireborn has a definite whimsical feel to the writing and dialogue. If you like whimsical dialogue that is sometimes a bit zany, you might enjoy that aspect ;-). Fireborn has some pretty graphically violent scenes (beetles swarming over and eating people, horrible burns) that really makes me not want to see it in the hands of middle-graders. Especially in the beginning of Fireborn, everything felt scattered and just downright strange. I had no real idea of what the central plot was going to be until about 50% and I didn’t enjoy how jumpy the storytelling was. Part of the problem causing the previous point are the number of characters. Fireborn is constantly jumping between characters, with only a couple of paragraphs in each POV before switching scenes. This might work with just a couple main characters, but I think I counted at least five different POV that we frequently jumped to. The names in Fireborn are fairly ridiculous and impeded my ability to take the characters seriously. The main MC is called Cabbage…. There is a wizard named Flaxfield and another female wizard named Flaxfold. When they are in a scene together, it’s freaking confusing! There was just way too little world-building in Fireborn for it to be a companion novel. This is the real spot where I think reading the previous novel would have significantly helped, since I had no idea what these humanoid species looked like, no idea where all these places that were being discussed were in relation to each other, and too little knowledge of the backstory surrounding the main villain and Flaxfield. It felt like there were things I was expected to already know about, which does not a companion novel make! The big ending is completely a let down and really quite a load of BS in my opinion. The children characters just abandon another character that they previously cared about. He is literally left trapped with the villain and no one seems to have a problem with this. That is how I want middle-graders to learn how to treat their friends, yup indeed…. Fireborn raised my interest in the first novel, Dragonborn, but I don’t recommend reading it as a companion/stand-alone novel. It also really doesn’t seem appropriate for middle-graders, though the lack of an intricate plot and character names that I could take seriously leaves me doubting that many older readers will be interested either. I would very much like to know if any of you have read Dragonborn and what your thoughts are on that one, since I suspect that that might have heavily changed my opinion on a couple elements of Fireborn. However, I doubt that I would have enjoyed Fireborn much more given the rest of the problems.